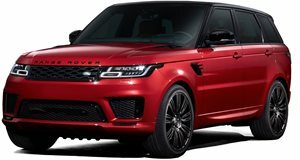 All new for 2019 is the Range Rover Sport Hybrid SUV, a turbocharged 2.0-liter gas engine paired with an electric powertrain. Rated at 398 horsepower and 472 lb-ft of torque, and with 31 miles of fully-electric driving, it is both powerful and efficient. The 13kWh battery takes 14 hours to charge with a standard wall outlet but that should drop significantly with a dedicated wall charger. Performance levels are excellent, however its $79,000 MSRP base starting price does pitch it above both the gasoline and diesel V6-powered Range Rover Sport models. Available only in HSE trim it comes well-equipped, but then so do its stablemates. Value-wise it makes the most sense if your commute involves numerous short trips that make the most of the electric powertrains capabilities. Standard equipment includes 20-inch wheels, panoramic sunroof, and a standard off-road package that adds a low-range transfer case and driver selectable terrain modes, reinforcing the Range Rover Sport’s off-roading credentials.